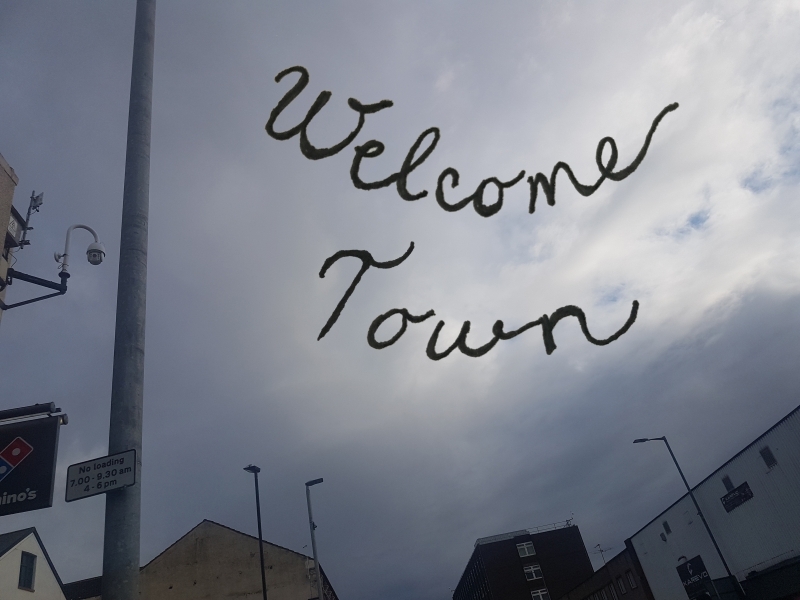 Welcome Town invites you on a personal walk with Natasha Davis, joined by local artists, artists with lived experience of migration and/or artists with strong interest in the subject of displacement and identity. The walk will mix facts, performative episodes, recollections and fantasy into a conversation about resilient towns and their migrant identities. How do distinct local histories merge with multiple characters of newcomers to Dublin? Where do their memories meet? How can we sustain ourselves as individuals and a community in our current realities? Following on Internal Terrains, the performance Natasha created with local participants for LCIF in 2013, the artist returns to Dublin with an alternative walking tour, starting and finishing at Project Arts Centre. Conversations will blend intimate stories of comings and goings with anything that you, our audience and fellow walkers, bring with you. Participatory and playful, Welcome Town is eager to exchange, debate, provoke and share stories of crossing borders, re-imagining how cities can care for displaced individuals. Perhaps we can decide together what a true welcome town is? This is a literal uprooting for Davis, who emigrated from her native Croatia before arriving in the UK in 2000, but it involves leaving pieces of herself behind. It is a gorgeous, pensive and clear image, swamped in its own space and time. Internationally renowned Artist Natasha Davis has been commissioned by Live Collision to mentor 3 artists for 1 year from April 2019 – 2020. Natasha Davis has an exceptional reputation for making imaginative and poignant performance work exploring body, memory, identity and migration. She will research and present her new work Welcome Town at Live Collision International Festival 2019. We are looking for three emerging artists who are interested in being part of this project as both a collaboration and professional developmental opportunity. This is not for the faint hearted but instead people who are seeking to find a pathway for their artistic interest and aspirations. The intensive workshops to develop the performance will be held in the afternoons Tuesday 23 April – Friday 26 April and the performance/alternative walking tour will take place on Saturday 27 April. You must have availability for at least 3 of the 4 workshops and you must be available for the performance on Sat 27 April. The performance will start and finish at the Project Arts Centre, with the main body of it happening outdoors in the streets near the art centre. No previously prepared material will be necessary, just the willingness to explore and excavate the subject of identity, memory, crossing borders and displacement. You will have the opportunity to present as part of Welcome Town at Live Collision International Festival on Saturday 27 April 2019. The workshops are free to selected artists and an honorarium of €150 for the performance day will be provided. Tickets for other presentations at Live Collision will be made available on request. Natasha will act as a mentor for 12 months with 3 – 4 meetings over that timeframe. This will provide an opportunity for advice, guidance and professional support over this gestation. The mentorship will be led by you (in terms of questions and focus) and Natasha will provide mentorship and guidance to the best of her ability and experience. If you have any questions or you’re interested in being involved please contact Matt Bratko at Live Collision at producer@livecollision.com or call +353 85 207 5985. If you would like to know more about Natasha’s work, please take a look at this short video where she is talking to Counterpoints Arts about her projects here or read an interview with Natasha ‘Performing Borders’ at here. Natasha Davis is a performance and visual artist with over 40 solo and collaborative projects in a range of media including live performance, installation, film and publication. Her work has been shown in the UK (National Theatre Studio, Tate Modern, Birmingham Rep, Rich Mix London, Barbican Plymouth, Playhouse Derry, Capstone Liverpool, Colchester Arts Centre and many others) and internationally in Cyprus, Greece, Ireland, Germany, Spain, Serbia, USA, Canada, Australia, India, China, and South Africa (at venues such as Power Station of Arts Shanghai, Project Arts Centre Dublin, Point Centre for Contemporary Art Nicosia, Theatre Works Melbourne etc). Her performance Internal Terrains heads the British Library’s online digital performance collection and is used as its banner and twitter icon. She collaborates with artists, scientists, academics and people from all walks of life, most recently with the University of Ottawa, VCA Melbourne, DDL Toronto and Science Gallery London. Her work is featured in Traces, a public project about migrant artists significantly contributing to UK arts, alongside luminaries such as Lucien Freud, Mona Hatoum and Frank Auerbach. Natasha’s work has been funded by Arts Council England, British Council, Tower Hamlets, Humanities Research Fund, Hosking Houses Trust, Transatlantic Fellowship and numerous commissions and residencies. She holds a doctorate from Warwick University and delivers lectures, talks and workshops across the world, from Buffalo to Tokyo to Grenoble to New Delhi. A monograph about her work, including texts by Natasha and other artists and scholars, is available via Live Art Development Agency’s Unbound.